The Phantoms went 17-5 during the regular season and were even crowned Regional Silver Stick champions at this year’s annual Silver Stick Tournament in Newmarket, Ontario, a Canadian suburb just outside of Toronto. (From left) Forward Patrick Pooler, Forward Patrick Kirlin, Forward/Defenseman Gavin Yeager and Defenseman Eddie Kelly raise their championship banners at the hockey rink near the Whitman Library at 2nd and Snyder in South Philly. Hockey may not be looked at as an urban sport, but don’t tell that to Gavin Yeager, Eddie Kelly, Patrick Pooler or Patrick Kirlin. 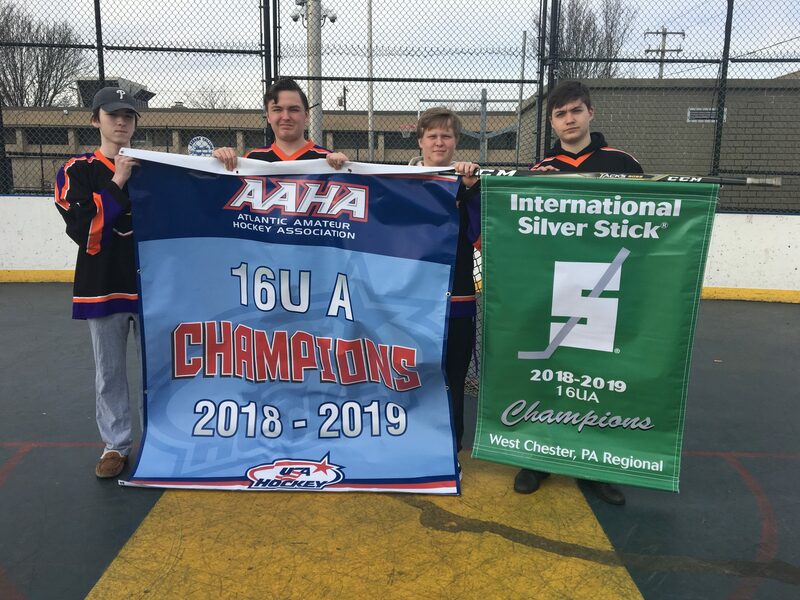 All four South Philly residents were part of the Tier Two 16U National District champion Delco Phantoms, who defeated the Haverford Hawks 3-2 in overtime on March 17. It was Yeager who got the game-winning assist on forward Ryan Kertis’s goal. Yeager said he always knew the expectations for this year were “high.” MacInnis echoed that sentiment. Luckily, the guys on the team all got along. In fact, Yeager, Kelly and Kirlin all live in the same neighborhood near the Whitman Library at 2nd and Snyder. Right behind the library is a roller hockey rink they all frequent. “Us three are probably around this park every day playing hockey,” said Kirlin. In true South Philly fashion, all the boys are Mummers as well. Yeager, Kelly and Kirlin all march with the Pirates. Pooler marches with Froggy Carr. Before beating the Hawks in the district finals, the Phantoms beat the Junior Penguins 3-1 in the quarterfinals and the flu-ridden New Jersey Penguins 11-1 in the semifinals. When asked about his favorite moments of the season – aside from winning the district championship – Kelly brought up a big mid-season win against Lancaster, in which the team trailed 5-1 going into the third period. The team recovered, scored four goals in the third period, and won the game in overtime.